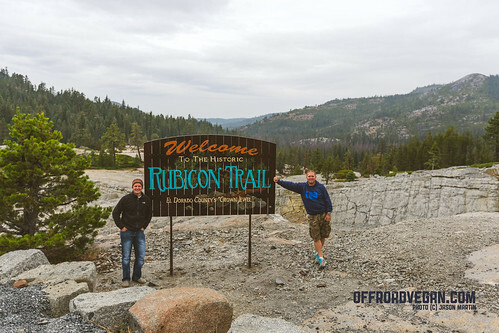 As we wearily made our way along Loon Lake approaching the trailhead, it was nice to see a new sign announcing the Rubicon Trail. We stopped for the required photos, and proceeded to air down in the massive parking area. Jason and I at the new sign. Our goal for day 1 was easily doable: Loon Lake to Buck Island Lake. 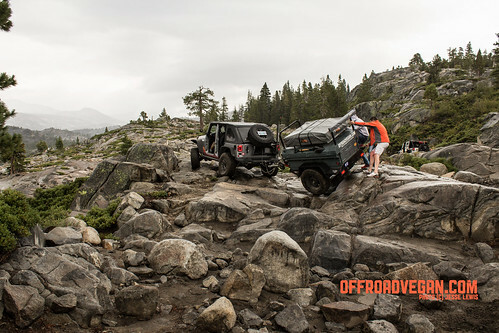 This is the same stretch we navigated last year in our Labor Day Marathon Rubicon run. However, even in the midst of one of California’s worst droughts, the rain still followed us from Oregon. In addition, a helicopter had crashed on the trail which threatened a long closure. We decided to move onwards in the face of the unknown. The Rubicon gets down to business right out of the lot, as you enter the Gatekeeper. 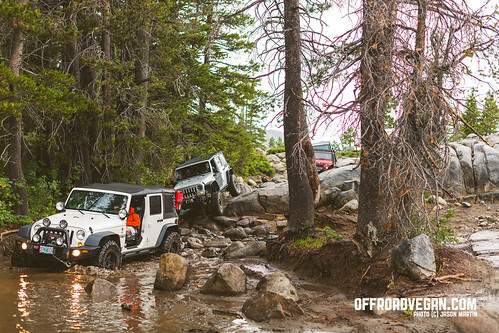 This section acts as a filter – both for driver skill and for Jeep capability. If you feel unsure here, or even break your rig, it is best to turn around. 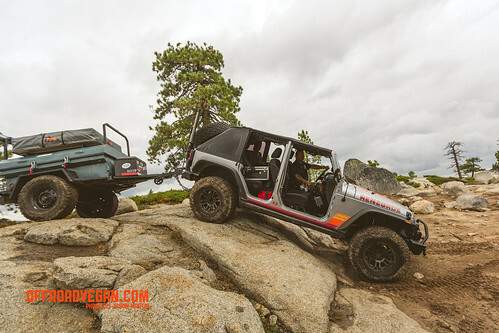 My Jeep and the trailer took a little getting used to as we crawled over the giant boulders, and snaked around the winding trail. Shortly after the gatekeeper, the trail opens up into some pretty amazing views. 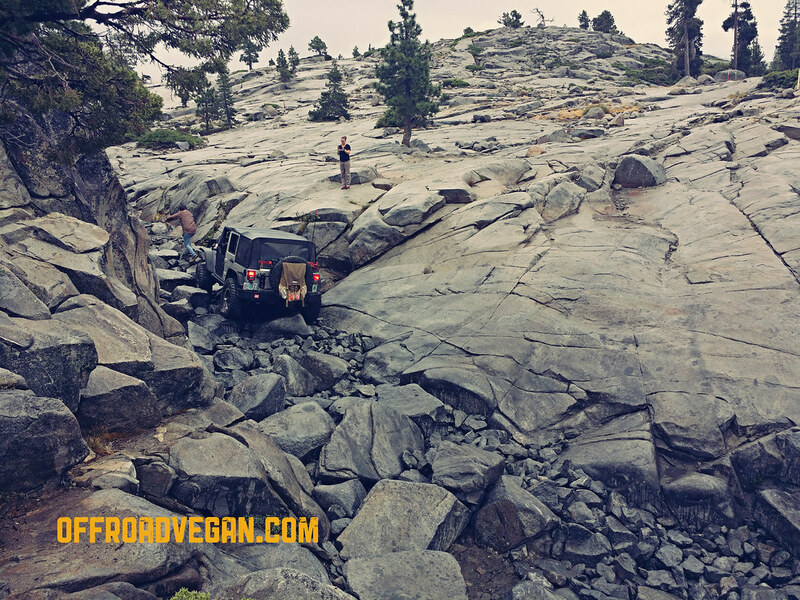 The rocky, rooted terrain gives way to smooth granite slabs as far as the eye can see. Obstacle-wise, this initial part of the trail doesn’t offer much. There are a couple of fun hills and ledges, as well as a couple of climbs that when wet make things extra fun. The first optional challenge is Little Sluice, which Robert was the only soul to attempt. The slick, wet boulders provided him with enough challenge, making him suggest we all take the bypass. With dinner reservations for Buck Island, we all agreed and moved along. 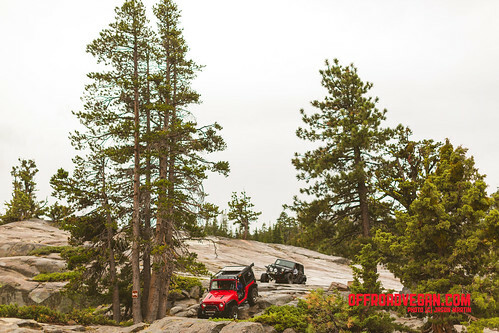 The views continue to change, from tight, narrow forests to alpine meadows and granite overlooks. My friend Jason, a professional photographer, took many opportunities to document the beauty of this place. The trail begins to slowly drop in elevation, as we made our way toward Buck Island Lake. The decrease in elevation is gradual, with only a few substantial drops. Just about at the “entrance” of Buck Island Lake is a series of granite slabs at some really fun angles. This “V notch” section is a lot of fun, but having good spotters will be important. We soon arrived at the Buck Island Lake area, and the task of finding a suitable campsite began. Immediately we found a large area, but across the trail was a huge group already with red solo cups in hand. They looked like a rowdy bunch. Fearing a repeat of last year’s BIL experience (of drunken screams all night and people night driving all over) we opted to check out our site from last year. 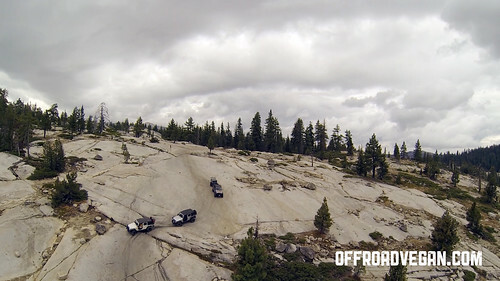 Chad radioed from ahead that our rock slab from last year was open, so we drove over the dam and staked our claim. The spot was smaller than I remembered, but with some creative spacing we all fit and settled for the night. Check out my deelish vegan dinner here. 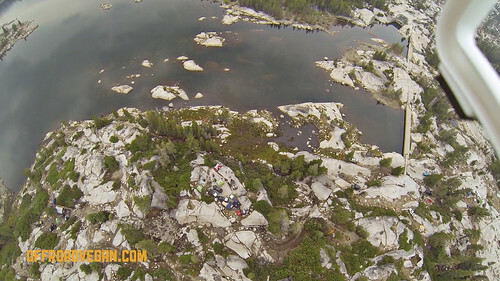 Aerial drone footage of our little campsite at Buck Island Lake. Click to enlarge. Any issues with the trailer? Did it slow the group down? Tight maaneuvers an issue? Or did it keep up just fine? I feel it held up just fine! There were a few lines I would have done differently and I needed some team help on those. But aside from maybe 2 instances it did not hold the group up at all. Thanks for checking out the blog! 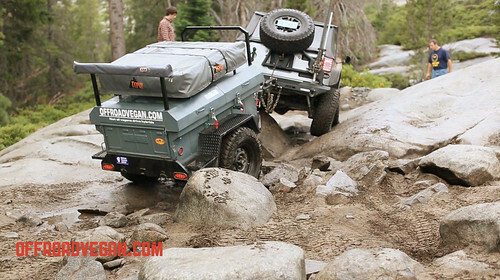 More interesting insights and adventures on the Rubicon!